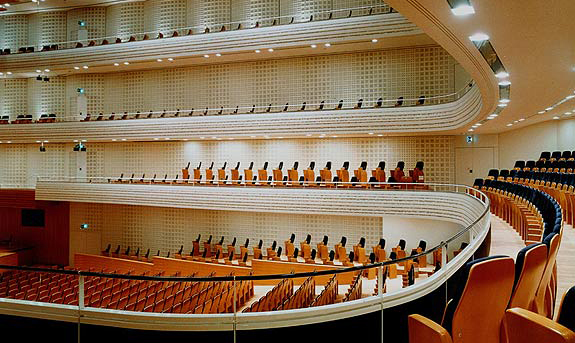 The 1800-seat Concert Hall at the Kultur- und Kongresszentrum Luzern [KKL] is the primary venue for the renowned Lucerne Music Festival, often hosting the major orchestras of Europe and North America. The narrow, modified-shoebox form includes a reverberant coupled volume, surrounding the hall, that connects with the main hall via walls which are also pivoting apertures. When open, even a modest amount, the expansive reverberant coupled volume is aurally accessible to the main performance volume, allowing for a great deal of variability in the reverberant field, depending on program demands. When the walls are opened, the deep red tones within the coupled volume visually bleed out onto the white plaster finish within the main hall. On the upper levels, patrons enter the main hall by passing through the coupled volume void.